It is impossible to understand stroke without a firm understanding of brain anatomy and physiology and pathophysiology. This is a brief run through the necessary basics. The brain contains 1011 neurons and approximately 10-50 times as many glial cells. Neurones are actually in the minority. About 40% of the human genome is involved in some part with its development and structure. The excitability of neurons is key to how the brain works. The brain requires an uninterrupted supply of ATP derived from oxidative phosphorylation to preserve this excitability. The Brain consists of two main types of cells - neurons and glial cells. Later in the neuropathology section we will talk a little about the neurovascular unit which is a hypothesised subunit of neurone and other associated cells and acts as a model upon which to discuss stroke pathophysiology. First we will deal with the components. Neurons are the main "brain cells" involved in information processing, information storage, sensing input and generating output. Their cell bodies which and when many are packed together are known as grey matter and can be seen on the cortical surface and within subcortical nuclei and brainstem nuclei and cerebellum and are peripherally called ganglia. The structure of individual neurons also varies depending on the individual role they play. Neurons are packed within the central nervous system at about 80,000 per mm3 of cortex and this is uniform across most of the cortex. The exception is the high density of 200,000 per mm3 in the primary visual cortex. Neurons are highly variable in their appearance and the function they perform, from Purkinje cells of the cerebellum to those that lie in the retina (the eye is an outgrowth of the brain) and to hair cells in the auditory system. Neurons in their simplest form consist of one end with a cell body which receives input from the dendrites. It is the inputs here which if occurring together or closely related in time can cause the neuron to fire off an action potential. This arises on the distal side of the cell body at an area called the axon hillock. There is localised depolarisation and this, in turn, passes along the axon to the axon terminal with what are called terminal boutons at the end which releases neurotransmitters into a synaptic cleft and can cause depolarisation of the next neurone through its dendrites. Collections of cell bodies are the grey matter and the often myelinated "wire like" axons are the white matter. Neurons have a cell nucleus surrounded by a soma or cell body rich in mitochondria, Golgi complexes, ribosomes, and smooth endoplasmic reticulum. Huge amounts of protein synthesis happen within the cell body and the dendrites but not in the axons. A sign of the protein production is the presence of Nissl substance which represents ribosomes. The axons transport substances including neurotransmitters, mitochondria, enzymes to make neurotransmitters from the cell body to the axon terminal. This is called anterograde flow. This is done actively using microtubules and molecules developed for the purpose. There are two kinds of anterograde transport - fast (30 cm/day) and slow (1 cm/day). Fast or rapid transplant carries proteins, vesicles, mitochondria. slow transport contains more structural elements. The soma also sends brain-derived neurotrophic factor which maintains axonal and synaptic health. Old organelles can be transported retrogradely at 15 cm/day. Anterograde transport uses tubulin and ATPases. Retrograde uses dynein ATPase. Retrograde transport is important in the pathogenesis of some diseases such as tetanus and rabies. Microglia: These are small cells hence their name but become much larger when activated by infection or inflammation. These are derived from the bone marrow and are cells of the immune system. They have several functions including acting as macrophages phagocytosing debris and fighting infection. Ependymal cells: These line the ventricles and have cilia on their surface which help direct the flow of CSF. They can give rise to rare tumours called ependymomas. Oligodendrocytes:These are responsible for myelination within the central nervous system. Myelination continues after birth and is not complete until teenage years. It is fundamental to allow axon conduction at faster speeds. Within the CNS one oligodendrocyte can myelinate 20-30 axons at one time. Within grey matter, there are many very short unmyelinated axonal fibres. The resting membrane potential is the electrical potential of the cell at its basal state. There are two forces acting at any one time across a selectively permeable membrane, first ions moving along their concentration gradient and secondly ions moving according to their electrical gradient such as a positive ions moving towards a negative charge. In the resting neuron there is a small potassium leak. Potassium concentration within the neuron is high. The membrane is impermeable to sodium and proteins and chloride. The potassium moves out of the cell along its concentration gradient. This leads to an increasing negative charge inside the cell which prevents further net movement. This gives us a resting potential of -60 mV. The Nernst equation is used to calculate the membrane potential. It assumes that the membrane is selectively permeable to an ion. Imagine we have 2 liquids separated by a semipermeable membrane but one side has a very high potassium concentration and the other a very low one. Both sides are electrically neutral due to the presence of other ions. When the experiment starts potassium will move down its concentration gradient. However the high concentration side will have lost positive charge and this will try to retain potassium. Eventually an equilibrium is reached. The Nernst equation defines this. All one needs is the concentration of the ions on either side of the membrane and their charge. Although changes of potassium are vitally important the absolute number of molecules that are involved in passing across the cell membrane is only a very tiny percentage of the total. To cause a neuron to depolarise it needs the correct stimulation at its dendrites and the net charge on the neuronal cell membrane of perhaps tens, hundreds or even thousands of axons synapsing on dendrites will determine whether sufficient stimulus is achieved to cause an action potential to be generated.. This can be by temporal excitatory summation where a series of impulses from one excitatory fibre over a period of time produce a membrane potential high enough to result in depolarisation or by spatial excitatory summation occurs when impulses in at least two excitatory fibres trigger an action potential. Note that not all stimulations are excitatory, indeed some GABA ion channels open chloride channels allowing the cell interior to become more negative and therefore hyperpolarised. Glutamate an excitatory transmitter however causes depolarisation. Hyperpolarisation is either due to movement in of chloride ions or movement out of potassium ions. The extreme negative charge closes sodium channels and renders the cell refractory until the membrane potential returns to normal. With an action potential stimulates a cell sufficiently the internal voltage increases to greater than 55mV. The threshold value for depolarisation is usually about 10 mV above the resting potential. At this level there is a transient increase in Na+ permeability by voltage gated sodium channels and this leads to Na+ movement into the cell and the inside of the cell becomes more positive which acts to cause even greater Na+ permeability with a positive feedback loop that rapidly increases the membrane potential. There follows a transient rise in potassium permeability such that it flows out of the cell making the inside more negative even more so then at rest. The ions pass through voltage gated ion channels. During an action potential the charge inside the cell can become even more negative and this is called hyperpolarisation often due to further movement out of potassium ions which can render the cells refractory for a short period. The Nernst equation can be used to calculate resting membrane potentials. Interestingly different cells in the body have similar but not always identical resting membrane potentials e.g. neurons -70 mV, glial cells -90mV skeletal muscle cells - 80mV and smooth muscle cells -70 mV. E K = - 90 mV , E Na = + 60 mV, Resting membrane potential = - 70 mV. Neuronal conduction is due to the passage of an action potential propagating along the axonal membrane. As one area of membrane depolarises this changes the condition for the adjacent cells and a continuous depolarisation occurs. This can be improved and speeded up dramatically by myelination which enables the depolarisation to jump from node of ranvier to the next one. This is known as saltatory conduction. One of the earliest signs of demyelination is slowing of the transmission of axon potentials along demyelinated fibres. Depolarisation at the axon hillock can cause an action potential to propagate as the membrane depolarises it causes adjacent membrane to depolarise and so on until it reaches the axon terminal. This causes the activation of voltage gated calcium channels which allows calcium to enter which causes the synaptic vesicles to fuse with the terminal membrane. Here the electrical transmission becomes chemical as neurotransmitters are released into synaptic clefts (exocytosis) and either have an affect on other neurons or muscle cells. This process of passage across the gap of 200 nm takes 0.05 ms. The gap is tiny and has been calculated as the width of a row of 200 atoms. The neurotransmitter then attaches to its post synaptic receptor and is then released and either reuptaken by the neuron or broken down. Electrical synapses also occur within the CNS and are much narrower between adjacent cells with distance of 2 nm involved. These are often called a nexus or a gap junction. These tend to be seen between glial cells rather than neurons. There is passage of ions which allows depolarisation. Outside the CNS this is seen in cardiac tissue, between adjacent myocytes. Most synapses between neurons are either axodendritic with the bouton applied to the dendritic spine of another neuron or axosomatic with the bouton against the cell body of another neuron. Axodendritic synapses are usually excitatory but axosomatic are usually inhibitory. The arrival of a neurotransmitter molecule at a post synaptic receptor can have several different outcomes. It can do nothing, it can depolarise that part of the membrane of the dendrite or axon it or the effect can be hyperpolarisation. This all depends on the receptor and the neurotransmitter. There are two main classes of receptors : ionotropic which consist of a central ion channel surrounded by multiple protein subunits which deliver a very fast and specific response. The other are metabotroptic receptors which involve G proteins and intracellular secondary messengers and have a more delayed response. Some neurotransmitters for example acetyl choline act at both types. 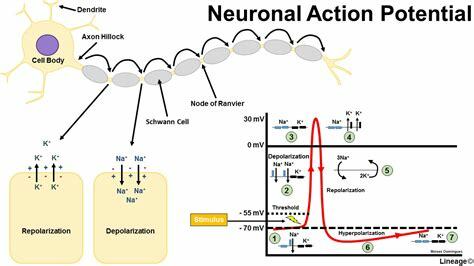 The interaction of a neurotransmitter on depolarising the area of membrane that is activated by a receptor may be an excitatory post synaptic potential. If the neurotransmitter hyperpolarises the cell this causes an Inhibitory post synaptic potential reducing the likelihood that the neurone with fire of an action potential down its axon. Remember 100s or even 1000s of these may be happening at any one time. It is the summation of all these that determine neuronal response. Summation can be temporal when rapidly repeated stimuli occur during depolarisation at one terminal or spatially when stimuli are received simultaneously from adjacent terminals. In practice both are important. For interest sake don't forget that both tetanus toxin and botulinum prevent the release of neurotransmitters. Botulinum prevents the release of Ach at the neuromuscular junction. Following binding the neurotransmitters become free and are either degraded locally or reuptaken back into the neuron or by the glial cells where they can be reprocessed or degraded. Synapses occur at the junction between the axon and an adjacent neuronal dendritic spine or cell body. It is fascinating that the density of dendritic spines is thought to play a role in learning and memory. Sometimes the axon bouton can synapse adjacent to another axon bouton and can alter its behavior through stimulation or what is termed pre synaptic inhibition often mediated by GABA which opens chloride channels hyperpolarising the membrane. There may be an assumption that there is a single signal sent and then all is quiet. In practice there is often a constant tonic level of firing and it is the change in frequency and intensity that changes. The frequencies can be from up to 100 Hz at some junctions. The firing pattern can itself carry information. There is evidence that synapses can change 'Plasticity' depending on the degree and frequency of stimulation. This can be seen by changes in the post synaptic thresholds. May play a role in memory. To make changes the stimulus must be strong such as due to multiple simultaneous inputs. There should be the resultant firing of the post synaptic action potential. Calcium flux appears to be important. Plasticity can be short and long term. The brain makes up only 1-2% of body mass but gets about 15% of the cardiac output, 20% of the total body oxygen consumption and 25% of total body glucose utilisation. The brain does not store glucose in any form as do other organs and is incapable of anaerobic metabolism. It is a very vascular organ. It needs to be as metabolism in the brain is high especially in the grey matter. The highest demand per volume is in the occipital cortex. The work of maintaining the excitability of cells which requires the movement of ions across cell membranes demands the manufacture of large quantities of ATP. It is not just the neurones but also the astrocytes that require a steady supply of blood flow. Astrocytes perform vital important functions such as maintaining extracellular K+ homeostasis and ensuring the rapid reuptake of neurotransmitters released by neurons. Cerebral perfusion studies looking at local flow have shown that changes of 100% to 150% of flow can occur within seconds of increased neuronal activity for instance in the contralateral primary motor cortex on asking a subject to clench a fist. It has also been seen that sudden rises in systemic BP are compensated for by increased sympathetic tone constricting the large and medium sized arteries to protect the distal circulation. Autoregulation of cerebral blood flow is the ability of the brain to maintain relatively constant blood flow despite changes in perfusion pressure. Autoregulation is well developed in the brain, likely due to the need for a constant blood supply. The metabolic demand is so high that about 90% of normal brain consumption of ATP is required to maintain ion gradients and transmit electrical impulses comes from the oxidative breakdown of glucose. Molecules such as ketone bodies may be metabolised in severe starvation and lactate can also be metabolised. Neuronal cells have a very nigh metabolic rate and glycogen storage is poor. Anaerobic metabolism is not possible to any real extent. Glucose and oxygen supply must be continuous to match the high metabolic rate. Global blood flow is in the range of 50-60 ml/100g/minute. The brains extracts 50% of oxygen and 10% of glucose from arterial blood. Brain tissue does not require insulin for glucose to enter cells. The brain is very responsive or 'coupled' to localised increases in demand and there is an almost instant increase in blood flow to areas with a higher metabolic rate. This autoregulatory system is impaired in acute stroke [Pierre at al 2000]. The critical level at which cellular function becomes compromised varies from region to region but is roughly about 20 ml/100 g/minute and irreversible injury will occur at levels below 8-10 ml/100g/minute. 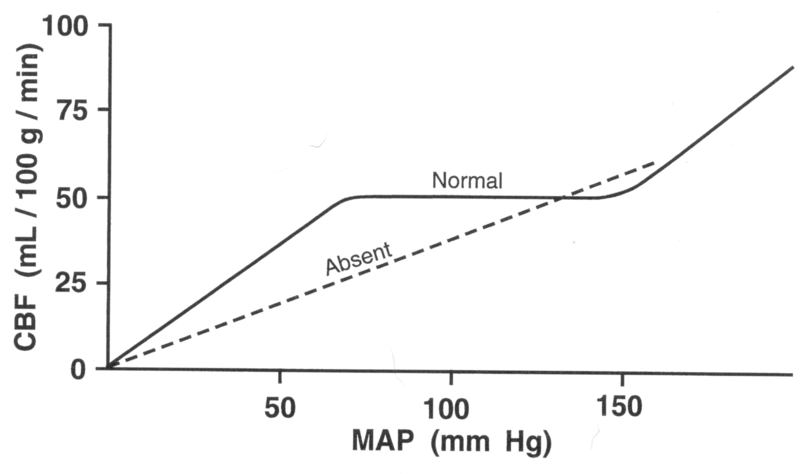 Infarction occurs where flow is most limiting or zero. This depends on both degree of hypoperfusion and duration of hypoperfusion and the neurones involved. In terms of treatment 'time really is brain'. Newer imaging techniques can help to delineate this as MRI-DWI marks infraction and MRI perfusion identifies hypoperfused brain tissue at risk. It is quite evident then that any impairment of local supply of glucose or oxygen reduces even for seconds there will be focal symptoms depending on the area of the brain which is compromised and its actions. Stroke as we will talk about is a vascular injury with obstruction of either large or small vessels by thrombi or microthrombi or emboli and downstream ischaemia. The small penetrating arteries that perfuse the subcortex and brainstem tend to be end arteries and cause small focal rounded infarcts. The larger branches of the circle of willis are also end arteries and depending on how proximal the occlusion and the extend of collaterals tend to cause a characteristic wedge shaped infarct extending to the cortical surface. Sometimes cortical tissue can be supplied by leptomeningeal or other vessels and can be preserved so that the infarct does not extend as far. Haemorrhage will also lead to downstream ischaemia of the tissues supplied by the vessel ruptured also compromised with localised pressure from haematoma collection. Studies have shown that bleeding the 'haemorrhage growth' can persist for hours after the initial clinical event, even in those with normal clotting function [Kazui S et al. 1996]. Ischaemic and Haemorrhagic lesions are also compromised by localised cytotoxic and eventual vasogenic oedema which can also cause pressure on surrounding large and small vessels. Not to be forgotten is the fact that ischaemic strokes can bleed and this has certainly increased with thrombolysis though often these bleeds are asymptomatic possibly as the bleeding has been into already infarcted brain. However occasionally haemorrhagic transformation of an infarct can be overwhelming and catastrophic. It is easier to start whole pathophysiology process at the cellular and cellular infrastructure level before working our way up to the more macroscopic events that happen with ischaemic and haemorrhagic stroke. In stroke the persisting focal loss of brain function is due to neuronal cell death. In vascular disorders Neuronal cell death happens when there is a localised area of reduced perfusion such that cellular respiration fails and normal cellular processes which are predominantly maintaining ionic balance, manufacturing ATP used to fuel active transport of ions across the membrane cannot continue and if this is prolonged there is no way for cellular function to be restored. Cells in the immediate area around the core of stroke tissue can stop working but can regain function when perfusion is restored or when clot is evacuated or a hemicraniectomy performed to reduced ICP. The area containing these salvageable cells is called the stroke penumbra. Preserving the cells of the penumbra is what hyperacute stroke therapies try to do [Ginsberg et al. 1994].